Would not have survived our wedding without Inked Events! We worked with Tracy for over two years planning the wedding of our dreams. When I first started interviewing planners, I knew she was the one when I was speaking to another planner who made me question our date due to the fact we had chosen a holiday weekend. I immediately called Tracy and asked her if she thought it might be an issue with the “leaf peepers” and Columbus Day weekend. She did some research, and came back to me with a report before we had given her money, signed a contract or anything. We got along right away, and I felt I could trust her. We hired her as a full wedding planner. This essentially meant she handled every part of the planning process. From design, managing vendors, budget, logistics, and day of coordination. Not everything in our wedding planning process was perfect, there were a few mistakes which were not her fault, but she did everything she possibly could to mitigate these issues. When a budget mistake occurred, she sacrificed money from her own paycheck to cover it. 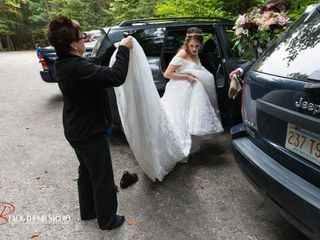 When the venue messed up and stopped a shuttle service (less than 0.1 miles but in heels or old people it is still tough) she used her own car to help. 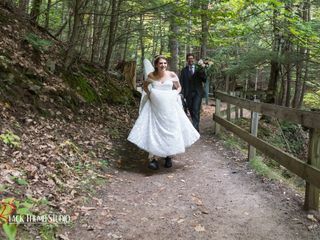 When we chose to do our first look at a waterfall and I was in 4 inch heels, she gave up her own shoes and went barefoot for me. She was incredibly professional and an absolute delight to work with. I would recommend her to anyone in the New England area planning an event. Although Tracy is incredibly professional in every way, she is also very friendly, and I walked away from our wedding with a friend for life. Tracy is amazing. She's always smiling, nothing is ever a problem, she keeps you on track, I couldn't have done my daughter's wedding without her. We had 221 people invited. Over 170 showed up. She not only helped me find vendors for the wedding, she handled the set up and break down of the wedding so that I didn't have to worry about anything. Her vendors were professional, fair in pricing, and provided a great product. There's a reason she's voted #1 every year, and it shows. Hiring Tracy and Inked Events was the best wedding decision we made! Tracy was incredibly professional, organized, and always readily available. Particularly in the week leading up to the wedding, she was extremely responsive to our emails and texts, coordinated so many details and vendors, and was a tremendous source of stress relief. She orchestrated a beautiful wedding and I am so grateful to her and her team. Tracy was super wonderful to work with! I highly recommend her! Inked Events did an amazing job with coordinating our wedding. Michelle was our main planner, but we also had the pleasure of having our first meeting be with Tracy. From the first phone call I had with Michelle and Tracy I knew that Inked Events would be there every step of the way. Michelle was incredibly responsive and organized, and helped me communicate with all of my vendors, organize a timeline, and so so much more. The day-of she brought 2 team members with her who were sweet, fun and so helpful. The entire team is fantastic and you will NOT regret using Inked Events! Tracy was truly one of the best decisions when we were planning our wedding. She truly went above and beyond her duties and made our day something we will always remember. She got to know us personally so she could take care of anything that went wrong on the day of without bothering us. She made our day go perfectly. She also had a great team that was able to run quick tasks and also run to the store when a dress mishap happened. Hiring Tracy will truly be the best decision you make when you start to plan your own wedding. As soon as we met Tracy we knew she was the wedding planner for us. And that was before she started to get into action! Tracy was part of my daughter's wedding plans from the very beginning - she is an amazing professional full of wisdom and advice. 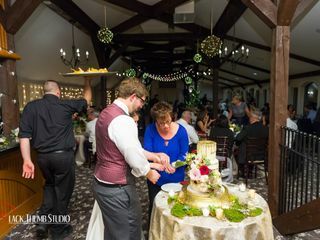 Her team and their organization to detail kept us moving forward until the culmination of a beautiful wedding that exceeded all of our expectations. Before the wedding friends and family would ask how I was handling the stress and warning me about wedding chaos. There was none of that. Our mantra throughout the whole process was, "Thank God for Tracy!" Beyond all of these accolades - Tracy is a warm and caring individual whose friendship we will always value! Let me start off by saying that hiring Tracy was the best thing that my parents could have done for our wedding. I cannot say enough good things about my Fairy God Mother (because, really, that's what she is!). So, I have to explain a little bit about myself first - I'm chronically ill with some pretty significant illnesses that make just about everything difficult. We got engaged in December 2017 and I was going back and forth from home (NH) to the Mayo Clinic in MN. It was an extremely difficult time for me, and in between visits to the hospital, we met with Tracy. Right away, we clicked. Tracy went beyond anything I could have expected in every way. Her professionalism cannot be topped, and yet, what I didn't realize at the time of hiring her what that it was the beginning of a friendship that I will continue to cherish. Tracy was a constant support throughout the entire wedding planning process, and not just with wedding details - she has a genuine quality to her that you just don't find in everyone. There were days she would just check to see how I was feeling. And I can't even say how much that meant to me. "Thank God for Tracy!" became our wedding motto. Not only is SHE awesome, her entire team was fantastic and the vendors she hooked us up with were the best of the best. We had nothing but full trust in her and she delivered beyond what we thought possible. My husband mentioned a muscle car in our first meeting off the top of his head - Tracy actually found the exact car and had it as a surprise for Dan and it picked us up at the church and drove us to Searles Castle. It was a complete fairytale of a day, everything went smoothly and the day was filled with joy and love all around. I would recommend Tracy to anyone and everyone. If we could give her 15 stars we would! We not only had the wedding of our dreams but also made a dear friend! Tracy, you're stuck with us! We love you! Tracy was hands down, the best money we spent for our wedding. The honestly do not know how we would have planned an out-of-state wedding without her help and expertise! She was so professional, but you leave feeling like you are friends! I did not feel like I had to worry about a thing on our wedding day and that was the most amazing feeling. 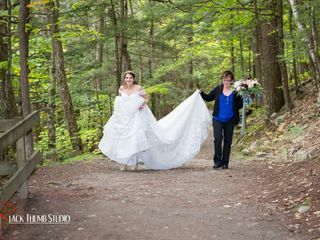 If you are even considering hiring a wedding coordinator, hire Tracy and you will not regret it! Michelle was amazing to work with. She went above and beyond to make our day what we dreamed of: from coordinating our vendors leading up to the wedding day to ensuring our event ran smoothly. We honestly could not have done it without her! Choosing Tracy as my wedding planner was the best wedding decision I made, aside from marrying my husband :) I could not have been more impressed with the professionalism, preparedness, and enthusiasm from Tracy and her team. I can confidently recommend Inked Events to all future brides and grooms knowing that she will continue to exceed expectations. Thank you Inked Events for helping me achieve my perfect day! Tracy was just wonderful, very professional, responsive and fun to work with. I highly recommend! We had a ceremony and wedding at our house on a lake in New Hampshire. There was an enormous amount of planning involved, including shuttles to and from local hotels, tents on the lawn, catering, and scheduling the day (pre-ceremony, ceremony, cocktails, dinner, a band, after-music hamburgers, etc.) Tracy was absolutely wonderful and guided us through the whole process. 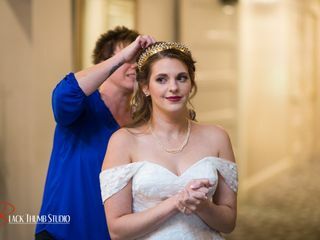 She and her staff (especially Lesley) helped maintain a mother-daughter relationship that was considerably strained with all of the stress associated with preparing for the event and making the day go well. 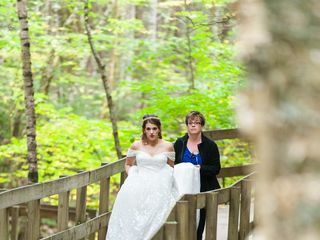 Tracy was also very receptive to our daughter's novel ideas and plans (e.g., the bride and groom left the ceremony by canoe with all the guests waving them off for a half-hour of peace before they joined the reception). I can’t say enough about Tracy and her team at Inked Events. My fiancé and I knew we wanted a wedding coordinator, and after our very first phone call with Tracy, my first words to my now-husband were “I love her, she’s perfect”. Throughout the wedding planning process, Tracy not only met, but exceeded my expectations. She was there every step of the way; from helping us pick our vendors, to making sure our invitations went out on time, and finally coordinating the wedding day of our dreams. We were able to truly just relax and enjoy the day knowing that Tracy was there to make sure everything was exactly the way we wanted it. Tracy went above and beyond to make our wedding a time we’ll never forget. We would recommend Tracy and Inked Events to absolutely anyone getting married, they were amazing and we were truly lucky to have them! The best investment we made was hiring Tracy. Not all little girls dream of a sugar and spice type of wedding. 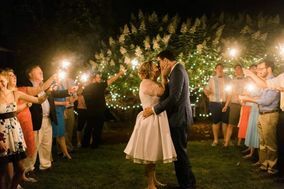 Some girls live out loud everyday and Tracy created the exact venue that was in my head, bringing it to life much to the delight of my family, friends, and for myself and my Husband. Her attention to detail and her ability to transform a back yard tented wedding into an evening where two unique families became one was amazing. In all of our planning my one request that I could not live without having was being able to come down the aisle on my vintage motorcycle racing sidecar. Tracy didn't even blink, as she said no problem, fulfilling and arranging a bucket list item for me. I have never been more happy, as my Dad and I blasted through the beautiful, fully decorated tent and down the aisle on our BMW. My guests are still talking about the "best wedding entrance ever." A flawless execution, 100% made possible by Tracy and her team. Tracy is organized, professional, creative and delivers a finished product that shows how incredibly talented she is. My family and wedding party adored her, and there was no detail left untouched on our big day. If you want to have a fun filled, stress free wedding experience with a supportive wedding planner that can do it all Tracy and her team from Inked Events is the best investment you could make. Tracy, you made my dream come true. Literally. I remember looking at Kev standing up there and our guests waiting for me to walk through the field, and listening to the music and seeing the décor in that moment. I started to cry and said to my dad “omg! That’s my dream right there! It actually came true!” Our guests have told us how amazing, beautiful and fun our wedding was. We’ve even heard “how can we ever top that?!”. I have to give you all of that credit. From the bottom of our hearts – thank you forever. OH my goodness, I'm blushing over here! I am deeply touched & extremely humbled by your lovely words and yes, insert me grabbing another tissue! I'm so glad to have been the one you chose to be your wedding planner and to be the one to make it official. All the weddings I have the honor of being part of are special, but truly having the honor to marry you two will be a memory that will be etched in my mind. When our daughter Kate and her fiance John asked us if they could have their wedding at our home here on the lake we agreed. The only stipulation being that a wedding planner would work with us to make it a very special day. On the day of the wedding we wanted to know that everything was being taken care of so that we could relax, enjoy our guests and dance the night away! We could not have done it without Tracy and her incredible team. After months of planning and anticipating the big day, Tracy and her girls took care of every detail and it all went off seamlessly! A heartfelt thank you to Inked Events for helping to make Kate and John's wedding a day we will always treasure. Aww Diane...thank you so much for the lovely review & kind words. It was an absolute pleasure to be part of Kate & John's wedding. Everything was amazing & I'm so glad you all had a wonderful, relaxing day. Inked Events and Tracy and her team were amazing! They listened to all my needs and were there helping me plan everything throughout the process. They did a great job problem solving, and making sure everything was seamless on my special day! I highly recommend! We loved working with Tracy and her team! Tracy was the day-of coordinator for a weekend wedding at the Cambridge Boat Club for us. She did a fantastic job coordinating the different vendors and making sure everything was running smoothly the day of. Our reception venue was separate from our ceremony location, and we had to bring everything in at our reception location. In addition, we had a limited amount of time to set-up as there was a morning event at the venue. Despite having a different vendor for every service and a limited set-up window, everything went as perfect as I could hope. The decorations were perfect, our guests had a fantastic time, we had a fantastic time, and if anything was going wrong, we couldn't tell! Leading up to the day, we had a great time getting to know Tracy through multiple face-to-face meetings and calls. She walked us through everything, reviewed timelines, contracts, and helped keep us on track. We also used Inked Events' floral services and were blown away by the floral arrangements. We had multiple calls with Jason to go over the details. He was extremely attentive, listened to our concerns about the ceremony venue, gave us his perspective on the reception venue, and helped create the exact environment we were looking for. Tracy, it was a pleasure working with you! Tracy really made our wedding day so worry free! She was so professional and took care of absolutely every last detail. We had such a great time and were really able to enjoy our wedding and our guests. We really enjoyed working with Tracy throughout the whole planning process. She was extremely thorough and we were in great hands. I would not have done it any other way! We appreciate Tracy's hard work in helping give us the most perfect, stress free day! If you are looking for the perfect person to make sure your wedding goes off without a hitch-you found her!! Tracy at Inked Events is a master of her kind and you will NOT regret hiring this wonderful person. As a bride to be with a to-do list that continued to grow, I felt as though I was getting over my head. When I booked my wedding, I believed that the venue coordinator would be my go-to for helping me to plan my wedding. I was wrong. The venue coordinator is only there to answer questions regarding the venue itself, and does not act as an actual wedding planner. After realizing that I was on my own, I thought that I should start to look for a wedding planner to see what they can do to help me. I did not initially think I would need a wedding planner as I could just figure it all out on my own. I was so wrong! My first conversation with Tracy was so refreshing and seemed like I was talking to an old friend. I could feel the stress of planning my wedding seem to go away and I immediately stopped my search for a wedding planner. We had multiple meetings leading up to the big day and Tracy would arrive with her binder that contained everything relating to the wedding. She would go through what we needed to do moving forward and always ensured me that everything was going great. On the day of the wedding, Tracy and her team were setting up while I was able to enjoy getting ready knowing that Tracy had everything under control. The wedding itself could not have been more perfect and I truly give a lot of the credit to Tracy and her team. She had a detailed timeline at how the night would go and coordinated this with all of my vendors. Everyone was on the same page and I was able to relax and enjoy the day. After the wedding, I did not have to worry about a thing! Tracy took down the decorations and made sure everything was taken care of. It is obvious that she loves what she does and you are lucky if you can get Tracy to be a part of your big day. We wanted to thank Tracy and her team for their stellar work. At first we thought that we could do everything by ourselves. Sooner rather than later we realised that we would need professional help the day of in order to coordinate all the vendors and their specific needs. Tracy was flexible and let us plan with all the vendors prior to the event. But the day of she was there 110% in order to coordinate around 20 people including friends that were also helping in setup. Tracy and her team was one of the best investments that we made for our wedding. Her job is to makes sure everything goes smoothly so you and your guest can just sit back and enjoy this great day! I would definitely recommended Tracy for a wedding or any other large event. I love Tracy at Inked Events! She is super organized, friendly and knows weddings inside and out. She's so passionate about weddings. 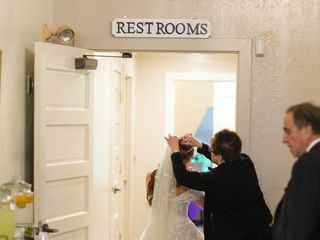 As a wedding photographer, I know how important it is to stay on schedule on a wedding day. With Tracy's lists and prep work, your wedding day will run flawlessly. I highly recommend Inked Events! I had worked with Tracy on another wedding where I was the officiant. I thought at that time that she was probably one of the best planners I had worked with. When it came time for my own wedding I called and hired her for my day of coordination...except that her day of coordination is more like 6 months! Tracy and her team are highly organized, professional and went above and beyond with unexpected issues that arose in the last days before our wedding. On the day of our wedding we did not think about anything other than enjoying ourselves. We can not speak highly enough of Tracy, her commitment to her clients as well as her work.